Break Oreos into small chunks and sprinkle across a 9″x13″ pan covered in foil. Pour candy coating over Oreos. Gently shake pan until coating evenly distributes over the entire pan. 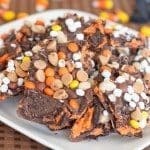 Sprinkle Reese’s Pieces, peanut butter chips, mallow bits, and peanuts over candy coating and gently press into chocolate. Put pan into refrigerator until coating fully hardens. Remove from refrigerator and break chocolate into pieces.